AeroGo air caster equipment uses a variety of Aero-Casters® to literally float heavy loads on a virtually frictionless film of air. Air casters provide a clean, quiet and safe alternative to moving heavy loads. Reduced friction and omni-directional movement allow the operator to precisely place and align the load in a limited work space. The low profile of the air caster Load Module requires less than 3-inch (76mm) clearance. Air casters will not damage floors and expensive reinforcement is usually not necessary. Because we use only basic pneumatic components such as air regulators and hoses, our products are not only reliable, but will operate in most environments. Prior to inflation, the load is solidly supported on landing pads. These pads protect the air caster torus bag from being crushed when the load is at rest. When standard shop air is applied to the air caster, the torus bag inflates, creating a seal against the floor surface and raising the load. When the pressure within the chamber is sufficient to offset the load's weight, air slowly and evenly escapes between the flexible torus bag and the floor. The load is literally floated on a thin, nearly frictionless cushion of air, .003 to .005 inches (.08 to .13mm) thick. 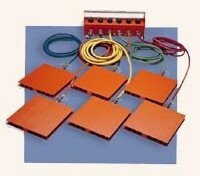 Load Module Systems move loads of varying sizes, shapes or weights. Weight capacities 1 to 360 tons utilizing 4 or 6 module configurations. Need to move equipment in a cleanroom environment? Ask about our anodized or powder coated models. Basic Even Loading - Know your load weight and how it's distributed to move safely. Contact us prior to your next move if you have any questions. Load Modules provide optimal load balance when arranged under the load in a triangle, square or 6-way pattern. 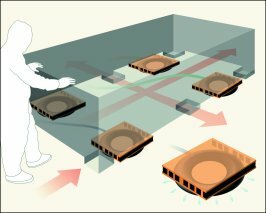 Familiarize yourself with your control console it will facilitate your move over temporary overlays, floor joints or cracks.